What Do You Do When The Roses Begin To Fade? What do you do when the “Roses” (your relationship) begin to fade? Divorce set in for us and it came a looong time after the roses had began to fade and die. We knew it was coming but we ignored the signs, hoping the hurt and pain, camouflaged as anger and bitterness, would eventually just go away but they never did. These were a gift from my husband for Valentines day, lol, yes, approximately 1 month and 3 days ago:). I know, I know, I should have taken “better care” of them while they were still “Fresh” & “Red” in color and in smell…but I forgot. I became so busy with the day to day “to do’s” of life that I just kept passing them by, saying to myself, “I’ve got to change the water & cut the stems on the bottom and even add more food to the water”…but I never did. As I stared at the beautiful flowers week after week, “hoping” I would get some time during the day to just talk to them & pay them some kind of attention, it never happened. And then one day I looked up & they we’re dying. 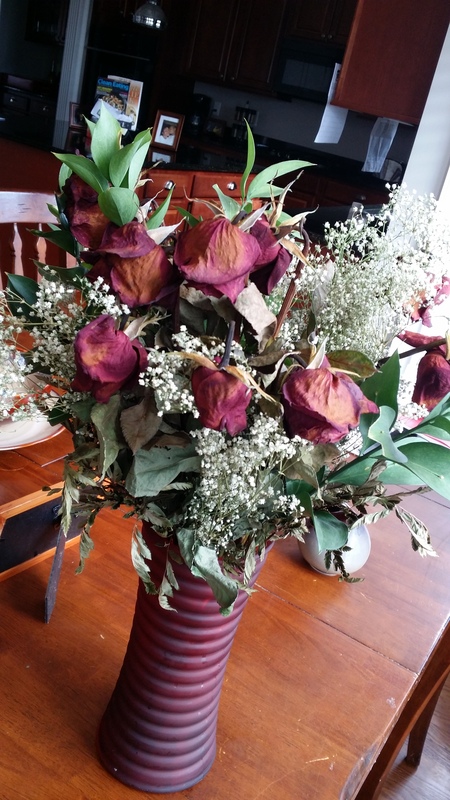 What was once a beautiful bouquet of brightly hued, deep red roses were now reduced to brown, shriveled up flowers. And be clear, you could still see some beauty in them, I mean after all, they “were” roses, the beauty that’s inside of a rose really truly never dies but they do fade & wither away because no one took the time to take care of them so now their beauty is a memory and it will now take a HUGE undertaking to bring the LIFE that was once pure and beaming and beautiful back to them. I wanted to take care of them & tend to their needs but I was just too busy to do so. So now, I either allow them to die & throw them out, or “STOP” EVERYTHING that I’m doing that doesn’t include the care & maintenance of them and do all that I know how in order to put life back into this beautiful and precious gift (my relationship/marriage) that was given to me. What do you do when the “Roses” (your relationship) begin to die? Divorce Saved our marriage but this a phenomenon that rarely happens. Even before marriage, during the dating stage, when the joy leaves and the roses start to wither and fade, STOP! Take a moment to reassess what’s really going on because roses only began to fade and/or wither away and die when there’s a lack of attention given to them. Are you paying attention to your mate/spouse? Take away: if given the proper love, care time and attention (nutrients) needed in order to not only survive but THRIVE beautifully, the roses (your relationship) will live way past their expected shelf life! #How My Divorce Saved My Marriage. #HMDSMM.